﻿ Armstrong Steel Makes "Comfy" Donation to the "Sock It To 'Em Campaign"
Denver, Colorado - Armstrong Steel, through its philanthropic foundation, Armstrong United, announced its participation in the “Sock it to ‘Em” Campaign, a program focused on providing socks to the homeless of Metro Denver this December. Armstrong Steel Employees donated over 100 pairs of socks to the cause during the 2016 holiday season. According to the campaign’s website, socks wear out faster than any other article of clothing and are the number one clothing need of the homeless. The “Sock it to ’Em” Campaign was launched in 2011 by Sue Lee, CEO of EQ Media and creator of “I Believe in Me!” When the entrepreneur recognized how many Americans face the harsh winter cold and dampness with inadequate protection for their feet, she asked a friend to join her in 2012 to form “Sock it to‘Em” and began soliciting fellow small business owners, churches, businesses and the local media to pitch in. 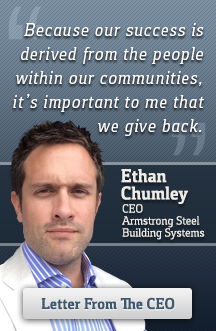 Armstrong United has a long history of community involvement and making donations to children’s and civic charities. In addition to the current donation to the “Sock It To ‘Em” Campaign, Armstrong Steel contributes to organizations that are important to its employees and customers, such as the ALS Association, Peyton Manning Children’s Hospital, United Way, Project Angel Heart, Habitat for Humanity, Dumb Friends League, The Denver Museum of Nature & Science, the Children’s Diabetes Foundation, the Denver Art Museum, the Boy Scouts of America and the Boys and Girls Clubs of Metro Denver.